How do you choose a projectilefor a coilgun? Is round better than long and skinny? What makes one projectile work better than another? This page is written from experience by taking measurements of various objects, and by modelling some projectiles using FEMM by David Meeker. To read more about my modelling read " FEMM Modelling". I found that long skinny things are good projectiles. A 1.25" drywall screw worked best in this coilgun. 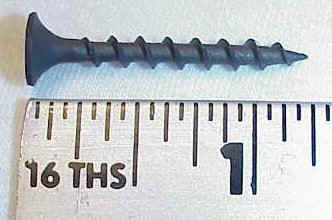 A large number of similar things like nails of various sizes worked nearly as well. There was less than 5% difference between any of them. The shape of a solenoid gives you long, straight lines of uniform magnetic flux down the middle of the tube. A projectile that "touches" a greater length of the flux lines will experience a greater force than a shorter projectile. The force is greatest when the projectile is about as long as the coil. To know the exact force for a given length, you should measure a force profile. I predicted a few things should be great, but was disappointed. I visited a local hardware store and bought one of anything that would fit into my tube. A door spring and a rolled cylinder were expected to be phenomenal, because they put a lot of ferrous metal nearest the coil. Being hollow they have less air resistance than solid plug-like masses. But their performance turned out to be indistinguishable from regular nails, because solenoids have a very uniform magnetic field. Once the object is inside the field, it doesn't matter what shape it is -- every object with the same permeability gets sucked in with the same amount of work. I found that round things (ball bearings and BBs) are really poor projectiles. They perform so poorly because they're short. For the best coupling between the coil and projectile, they should both be about the same length. I started my testing with ball bearings, and quickly abandonded them as soon as I tried the first nail. The coil had seven times more lifing power (at the same current) for nails compared to bearings. If I designed my own projectile, then I would start with some cool shapes used for another type of gun, which delivers Railgun Integrated Launch Packages developed for tactically-configured armor penetrating subprojectiles.